Headache is one of the most commonly experienced of all the physical discomforts. About half of the adults have a headache in a given year. Headaches can occur as a result of many conditions. Ophthalmologists are often the first physicians to evaluate patients with headaches, eye pain, and headache-associated visual disturbances. The evidence in the literature for a strong association between oculovisual problems and headache is weak. Still, patients who believe that appropriate ocular examination and treatment help to lessen their headache visit ophthalmologists very frequently. Although ophthalmic causes are sometimes diagnosed, eye pain and visual disturbances are often neurologic in origin. Many primary headache disorders have ophthalmic features, and secondary causes of headache frequently involve the visual system. Both afferent and efferent symptoms and signs are associated with headache disorders. Moreover, the frontal or retroorbital pain of some primary ophthalmic conditions may be mistaken for a headache disorder, particularly if the ophthalmologic examination is normal. This review summarizes the common causes of headache encountered in ophthalmic practice and the red flag signs which need referral to other specialists. Headache is a pain or discomfort anywhere in the head or face area. Headache can occur as a result of many conditions whether serious or not. It can be challenging to differentiate between low-risk, benign headaches and high-risk, dangerous headaches since symptoms are often similar. The brain itself is not sensitive to pain, because it lacks pain receptors. However, several areas of the head and neck do have pain receptors and can thus sense pain. These include the extracranial arteries, middle meningeal artery, large veins, venous sinuses, cranial and spinal nerves, head-and-neck muscles, the meninges, falx cerebri, parts of the brainstem, eyes, ears, teeth, and lining of the mouth. Pial arteries, rather than pial veins, are responsible for pain production. Headaches often result from traction to or irritation of the meninges and blood vessels. The nociceptors may be stimulated by head trauma or tumors and cause headaches. Blood vessel spasms, dilated blood vessels, inflammation or infection of meninges, and muscular tension can also stimulate nociceptors and cause pain. Headaches are broadly classified as “primary” or “secondary.” Primary headaches are benign, recurrent headaches not caused by underlying disease or structural problems. While primary headaches may cause significant daily pain and disability, they are not dangerous. Secondary headaches are caused by an underlying disease, such as an infection, head injury, vascular disorders, intracranial hemorrhage, or tumors. Secondary headaches can be harmless or dangerous. Certain warning signs indicate a secondary headache may be dangerous. Ninety percent of all headaches are primary headaches. Primary headaches usually first start when people are between 20 and 40 years old. Most primary headaches slowly develop over minutes to hours. The pain experienced in headache is transmitted by the slowest of all unmyelinated nerves. The most common types of primary headaches are migraines and tension-type headaches. They have different characteristics. Migraines typically present with pulsatile head pain, nausea, photophobia, and sensitivity to sound. Tension-type headaches usually present with “bandlike” pressure on both sides of the head, not accompanied by other symptoms. Gastrointestinal disorders may cause headaches, including Helicobacter pylori infection, celiac disease, nonceliac gluten sensitivity, irritable bowel syndrome, inflammatory bowel disease, gastroparesis, and hepatobiliary disorders. The treatment of the gastrointestinal disorders may lead to a remission or improvement of headaches. Most headaches can be diagnosed by the clinical history alone [Figure 1]. The first step to diagnosing a headache is to determine if the headache is old or new. A “new headache” can be a headache that has started recently or a chronic headache that has changed character. The onset, duration, quality, location, and exacerbating and relieving factors of the pain are important points to elicit. The clinician should ask about any associated factors such as aura, tearing, rhinorrhea, nausea, and photophobia. A history of rhinitis, recurrent or acute sinusitis, purulent nasal discharge, and hyposmia should be elicited. Comorbid illness such as diabetes, hypertension, dental disease, psychiatric illness, or a history of head or facial trauma or prior surgery should be questioned. A review of systems should include constitutional symptoms such as weight loss, fatigue, fevers, and gastrointestinal complaints. The patient should provide a full list of his or her medications, as overmedication of headaches is a significant risk. A social history should include a history of substance abuse, caffeine use, and use of alcohol or tobacco. A family history of migraine, other headache, or head-and-neck cancer should be noted. It can be challenging to differentiate between low-risk, benign headaches and high-risk, dangerous headaches since symptoms are often similar. No new concerning history or physical examination findings. A number of characteristics make it more likely that a headache is due to potentially dangerous secondary causes which may be life-threatening or cause long-term damage. These “red flag” symptoms mean that a headache warrants further investigation with neuroimaging and laboratory tests. Systemic disease (HIV infection, malignancy). The eye is a transparent, superficial organ, and routine examination techniques readily identify ocular causes of headache. There has been ongoing debate whether uncorrected refractive error causes asthenopia or eye strain. Although there is little evidence that refractive error or strabismus directly causes headaches, appropriate correction may improve symptoms. Untreated hyperopia can result in persistent attempts to accommodate, thus relaxing accommodation with hyperopic prescription may lessen the eye discomfort. Accommodative spasm usually occurs in young patients and presents with eye pain, myopia, and miosis when doing near work. Management is reassurance and general relaxation techniques. Any ocular surface disease should be treated. Uveal and scleral inflammation should be addressed with anti-inflammatory therapy and workup for underlying systemic causes. Acute elevation in intraocular pressure is usually associated with pain, while an eye with a similar pressure of gradual onset may be asymptomatic. While acute angle-closure glaucoma is the most common painful glaucoma, some forms of secondary open- and closed-angle glaucoma are associated with acute pressure spikes and pain. Retrobulbar optic neuritis presents with subacute loss of vision and pain on eye movement with normal-appearing optic nerves initially. In papillitis, there is disk swelling. Temporal headache in an elderly person should alert one to a possibility of giant cell arteritis (GCA), which is an emergency. The most common definable headache syndromes are those designated migraine, with a prevalence of 5%—25% and a marked female preponderance. Migraine without aura, or common migraine, represents more than half of migraine headaches. Most often, the headache is unilateral, variable in frequency, and lasts a minimum of 4 h. Unilaterality, it is less common in children (approximately 20%). The pain is usually throbbing or pulsating, moderate to severe, and aggravated by physical activity, bright lights, and loud noises. A clear relationship with menstrual cycle has been established. A hallmark of migraine without aura is the absence of permanent neurological deficits. Migraine with aura, formerly called classic migraine, constitutes 10%—35% of migraines and consists of aura, headache, and postheadache period. The aura is a transient cortical or brain stem dysfunction of gradual onset and <60-min duration. Auras can be divided into visual and neurological with both occurring at the same time in 88%. Neurological auras are paresthesias, numbness, motor weakness, vertigo, aphasia, alexia, and even hemiplegia. Paresthesias in extremities are especially common with visual auras, and symptoms in the extremities are characteristically associated with visual aura. Visual auras are thought to originate in striate cortex and range from an enlarging scintillating spot to a complete homonymous hemianopia. Scotomas may be positive or negative. The shimmering border of scintillating scotomas is colored lines forming angles and polygons to produce so-called fortification figures that usually progress from central field to the periphery. Headache, on the contralateral side, typically follows aura and lasts for several hours. Other visual symptoms in migraine are micropsia, macropsia, diplopia or polyopia, halos, movement of stationary objects, changes in color, and even formed visual hallucinations. Migraine with aura does carry a small risk of ischemic stroke. A tension, stress, or musculoskeletal headache is the most common headache syndrome encountered in clinical practice, with a lifetime prevalence of 30% to 78%. Tension headaches can be divided into episodic (frequent and infrequent) and chronic. They are usually characterized as bilateral, mild-to-moderate pressure pains. The duration of symptoms varies, from minutes to days. Nausea and vomiting are not experienced with tension headaches, but phonophobia or photophobia can be present. The finding of muscle tension is not an exclusive sign of tension headaches and can be seen in patients with migraines. This headache syndrome manifests as recurrent episodes of excruciating unilateral orbital or temporal pain. The episodes of pain are often between 15 and 180 min. Men are more often affected than women. The attacks occur in phases, each phase lasting anywhere from 4 to 16 weeks with about 1—2 phases occurring per year. This headache syndrome is characterized by frequent, short attacks of unilateral pain in the temporal or supraorbital region. The attacks can last anywhere from 2 to 30 min and occur more than 5 times per day. An attack can be associated with symptoms of sympathetic dysfunction that include conjunctival injection, nasal congestion, rhinorrhea, eyelid edema, forehead or facial sweating, Horner syndrome, and a sense of restlessness or agitation. Primary thunderclap or stabbing headache is a sudden-onset, high-intensity pain. It is a diagnosis of exclusion and must be differentiated from an intracranial hemorrhage, venous sinus thrombosis, unruptured vascular malformation, arterial dissection, central nervous system angiitis, reversible benign angiitis, cerebrospinal hypotension, paranasal sinusitis, and pituitary apoplexy. Other headache syndromes include primary cough headaches, primary exertional headache (e.g., with sexual activity), and hypnic headache, also termed alarm clock headache. A posttraumatic headache begins within 7 days of the incident traumatic event. The features of the headache are variable, often not well defined, and accompanied by a multitude of neuropsychiatric symptoms, including irritability and poor concentration. Interestingly, there has been no definite relationship established between the severity of head trauma and headache, but in general, posttraumatic headache is less frequent after severe head injury. Posttraumatic headache may be more common in patients with preexisting psychopathology. Vascular headaches are temporally related to a major vascular disorder or event. In many of these conditions, the headache can be the initial warning sign of the vascular disorder or event, such as ischemic stroke, intracranial hemorrhage, AVM, or internal carotid artery (ICA) dissection. Headache occurs in 17% to 34% of patients with an acute ischemic stroke. The pain is more common in basilar artery rather than carotid artery territory strokes and is usually described as unilateral and moderate in intensity. In some cases, the headache can last more than 24 h. Since the dural covering of the posterior cranial fossa is innervated by CN V1, patients with an acute occipital lobe infarction may experience pain in and around the ipsilateral eye. Visual field testing will reveal contralateral homonymous hemianopia in such cases. Transient ischemic attacks (TIAs) can also be associated with headaches. In some cases, a TIA can mimic the symptoms of a migraine with aura. A previous history of migraine headache, undetermined episodic headaches in the past, scintillating scotoma, and the characteristic “buildup” or fortification of visual symptoms lasting for about 20—30 min are all suggestive of migraine. TIA symptoms are usually shorter in duration (1—10 min) than migraine symptoms and positive phenomena are quite rare. SAH is the most common cause of a sudden intense and incapacitating headache. The pain is usually unilateral and associated with nausea, vomiting, nuchal rigidity, and occasionally fever or cardiac dysrhythmia. Such patients may present to the ophthalmologist because of blurred vision and photophobia. Eighty percent of nontraumatic cases of SAH are due to a ruptured intracranial aneurysm. An aneurysmal SAH is a neurosurgical emergency associated with very high morbidity and mortality rate. Intraretinal or vitreous hemorrhage may be seen (Terson syndrome). A sentinel headache is a transient (up to 2 days) pain syndrome due to a limited aneurysmal SAH that resolves spontaneously. It has also been termed “a warning leak” because it precedes the onset of a major SAH by a few days and can be misinterpreted as a migraine headache. A chronic epidural or subdural hematoma may cause a headache associated with memory loss and nausea. The pain associated with an AVM can be mistaken for a migraine with aura. An important differentiating characteristic of an AVM-associated headache from a migraine headache is the same-side repetitive nature of the pain, which is in contrast to the unilateral pain of a migraine headache that switches sides from attack to attack. Thus, persistent unilateral migraine should be assessed with neuroimaging to exclude the presence of an AVM. ICA dissection presents with sudden-onset neck, head, or facial pain described as moderate to severe in intensity with a throbbing quality. The pain may be the presenting symptom in up to 75% of cases and as many as 60% of patients may have an ipsilateral Horner syndrome. Other neuro-ophthalmic manifestations include transient vision loss, anterior or posterior ischemic optic neuropathy, central retinal artery occlusion, ocular motor cranial nerve (CN) palsy, and ocular ischemic syndrome. ICA dissections can occur after major or minor head-and-neck trauma. Other underlying etiologies include Marfan syndrome, Ehler—Danlos syndrome, fibromuscular dysplasia, and syphilis. Headaches are common with all types of meningitis. Associated neurologic findings include nuchal rigidity and Kernig or Brudzinski signs. The headache is often times continuous and nonlocalizing. There may be optic disc edema or sixth nerve palsy due to increased intracranial pressure. When meningitis is suspected, urgent neurologic assessment is required. Pituitary apoplexy is a rare but life-threatening condition. It is caused by a hemorrhage into or infarction of the pituitary gland, usually in the presence of a preexisting pituitary tumor. The headache is acute, severe (thunderclap), and retroorbital or frontal in location. Upward expansion of the pituitary gland from the hemorrhage may result in compression of the visual apparatus causing unilateral or bilateral vision loss. Lateral expansion into the cavernous sinus may produce unilateral or bilateral and single or multiple ocular motor cranial neuropathies. The headache in GCA is the result of inflammation within arteries supplying the scalp. In particular, inflammation of the branches of the superficial temporal artery results in focal scalp tenderness. The head pain can be variable in intensity and imitate any of the primary headache syndromes. Thus, although headache is a nonspecific symptom of GCA, any recent-onset headache or change in character of long-standing headaches in a patient older than 55 years should raise the suspicion for GCA and supporting clinical and/or laboratory data should be obtained. Attacks of transient visual loss may precede permanent visual loss. GCA is a medical emergency because of the major risk of irreversible vision loss. Increased intracranial pressure (ICP) can be caused by an intracranial space-occupying lesion, communicating hydrocephalus, venous sinus obstruction, metabolic disorders, or primary and secondary idiopathic intracranial hypertension (IIH) syndromes. The headache associated with increased ICP is often occipital or retroorbital in location. It is generally worse on awakening, exacerbated by straining or bending forward and may have migrainous features. Some patients may describe pulsatile tinnitus. IIH is characterized by an increase in ICP in an otherwise neurologically intact person (except for sixth CN palsy) with normal neuroimaging and cerebrospinal fluid (CSF) composition. Its incidence is greatest in overweight women in their reproductive years. This condition is usually caused by a spontaneous or iatrogenic (postlumbar puncture) CSF leak. In contrast to IIH, the headache of intracranial hypotension is worse on standing. The location of the pain can be either focal (frontal or occipital region) or diffuse. The headache is often described as a dull, throbbing pain worsened by straining. Sixth CN paresis (unilateral or bilateral) has been reported in some patients with intracranial hypotension. Theophylline, caffeine, and bed rest can minimize the postlumbar headache. Typical medications resulting in MOH include ergotamine, triptans, analgesics, opioids, and combination analgesics. The disorder seems to be more prevalent among patients with a predisposition for headaches and in the setting of a chronic daily headache. Headaches may develop in some patients with systemic hypertension if the autoregulatory mechanisms that maintain a constant cerebral blood flow are affected. Acute elevations in arterial blood pressure cause localized cerebral edema, ischemia, or hemorrhage and result in a headache. In severe cases, optic nerve swelling, often with retinal hemorrhages, can be observed from either papilledema or ischemic optic neuropathy. Headaches occur in about 75% of patients with hypertensive encephalopathy. High-altitude headaches, diving headaches, and sleep apnea headaches are classified under headaches caused by hypoxia/hypercapnia. Acute mountain sickness is characterized by headaches, nausea, fatigue, sleep disturbance, and anorexia. Low-dose acetazolamide can minimize or prevent symptoms. The headaches usually respond to low-potency analgesics. Neuralgic pain is usually brief, severe, and electric or burning in nature. It is caused by compression or irritation of the central nervous system pathways. Trigeminal neuralgia is characterized by unilateral, paroxysmal (<2 min) pain affecting one or more divisions of CN V. Between attacks, there is no pain or sometimes just a dull, mild background pain. In many cases, the pain is triggered by sensory stimulation of the face. However, sometimes other sensory stimulation such as bright lights or loud sounds can trigger an attack. Occipital neuralgia presents with paroxysms of pain in the distribution of the greater, lesser, and/or third occipital nerve. Tender trigger points involving the cervical muscles or pain from atlantoaxial and upper zygapophysial joint disease may give similar symptoms to occipital neuralgia. This type of neuralgia is the result of trauma, surgery, neoplastic infiltration/compression, or idiopathic damage to the supraorbital nerve. The pain is distributed over the course of the supraorbital nerve with tenderness of the region on clinical examination. Postherpetic neuralgia is a sequela of reactivation of dormant varicella-zoster virus. CN V1 is involved in 80% of cases affecting the head. It is most often seen in the elderly and immunocompromised patient. The characteristic skin rash with vesicle formation precedes the pain by <1 week, but the pain can persist for several months to years. This type of migraine is characterized by recurrent attacks of headaches associated with paralysis of one or more of the ocular motor CNs. It is a rare condition mostly seen in children. The third CN (with pupil involvement) is most often affected. The headache lasts about a week and may precede the external ophthalmoplegia by a few days. Sphenoid sinus - Vertex, occipital, frontal, and retroorbital pain. Cervicogenic headache is a syndrome characterized by chronic hemicranial pain that is referred to the head from either bony structures or soft tissues of the neck. Patients with cervicogenic headache will often have altered neck posture or restricted cervical range of motion. The head pain can be triggered or reproduced by active neck movement, passive neck positioning, especially in extension or extension with rotation toward the side of pain, or on applying digital pressure to the involved facet regions or over the ipsilateral greater occipital nerve. Muscular trigger points are usually found in the suboccipital, cervical, and shoulder musculature, and these trigger points can also refer pain to the head. Headaches that present to an ophthalmologist include migraine, facial pain syndromes, and pain associated with cranial neuropathies, orbital, and ocular disease. Some headaches are symptoms of medical emergencies, placing the ophthalmologist in the frontline of their recognition and management. One must keep in mind the “red flags,” and timely referral to other specialists is crucial in the management of headaches. Since 90% of the headaches are simple primary headaches and can be diagnosed based on history alone, it is important to take detailed history. Patients with chronic headache should be encouraged to maintain headache diary keeping detailed records of headache episodes. This provides additional insight about triggers and how to avoid them. Various triggers are thought to initiate migraine headaches in people who are prone to developing them. Different people may have different triggers. Common triggers include certain foods, especially chocolate, cheese, peanuts, and monosodium glutamate which is used to enhance flavor in many foods, dehydration, fatigue, missing a meal, sleep deprivation, stress, the effects of medications, smoking, alcohol, contraceptive pills, viral infections, loud noises, common colds, head injury, rapid ingestion of a very cold food or beverage, and dental or sinus issues. Hainer BL, Matheson EM. 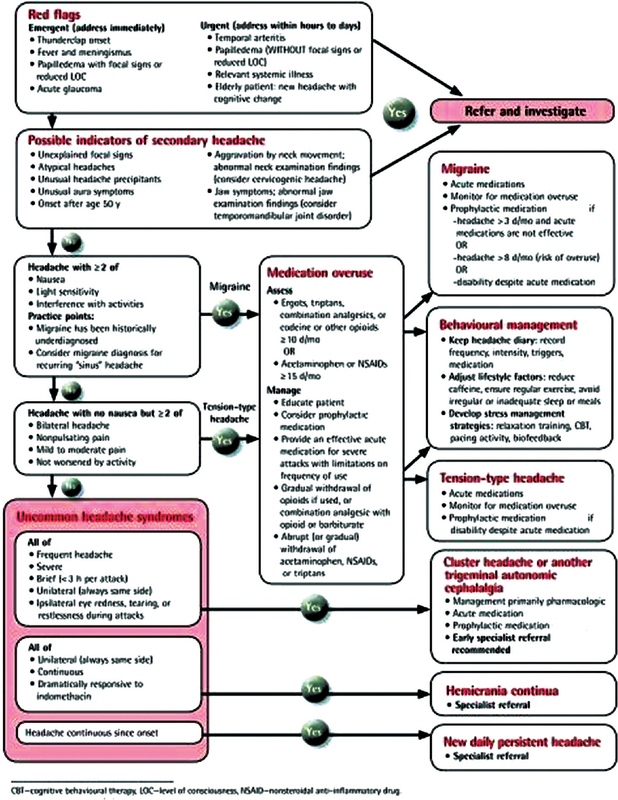 Approach to acute headache in adults. Am Fam Physician 2013;87:682-7. Walker HK, Hall WD, Hurst JW. Headache. Clinical Methods: The History, Physical, and Laboratory Examinations. 3rd ed., Ch. 54. Boston: Butterworths; 1990. Schankin CJ, Straube A. Secondary headaches: Secondary or still primary? J Headache Pain 2012;13:263-70. Detsky ME, McDonald DR, Baerlocher MO, Tomlinson GA, McCrory DC, Booth CM, et al. Does this patient with headache have a migraine or need neuroimaging? JAMA 2006;296:1274-83. Cámara-Lemarroy CR, Rodriguez-Gutierrez R, Monreal-Robles R, Marfil-Rivera A. Gastrointestinal disorders associated with migraine: A comprehensive review. World J Gastroenterol 2016;22:8149-60. Ravishankar K. The art of history-taking in a headache patient. Ann Indian Acad Neurol 2012;15:S7-14. Gil-Gouveia R, Martins IP. Headaches associated with refractive errors: Myth or reality? Headache 2002;42:256-62. Skaer TL. Clinical presentation and treatment of migraine. Clin Ther 1996;18:229-45. Lawton MT, Vates GE. Subarachnoid hemorrhage. N Engl J Med 2017;377:257-66. Liozon E, Ly KH, Robert PY. Ocular complications of giant cell arteritis. Rev Med Interne 2013;34:421-30. Wall M. Idiopathic intracranial hypertension (pseudotumor cerebri). Curr Neurol Neurosci Rep 2008;8:87-93. Raskin NH. Lumbar puncture headache: A review. Headache 1990;30:197-200. Granella F, Farina S, Malferrari G, Manzoni GC. Drug abuse in chronic headache: A clinico-epidemiologic study. Cephalalgia 1987;7:15-9. Devor M, Amir R, Rappaport ZH. Pathophysiology of trigeminal neuralgia: The ignition hypothesis. Clin J Pain 2002;18:4-13. Rebeiz EE, Rastani K. Sinonasal facial pain. Otolaryngol Clin North Am 2003;36:1119-26. Hall T, Robinson K. The flexion-rotation test and active cervical mobility — A comparative measurement study in cervicogenic headache. Man Ther 2004;9:197-202.